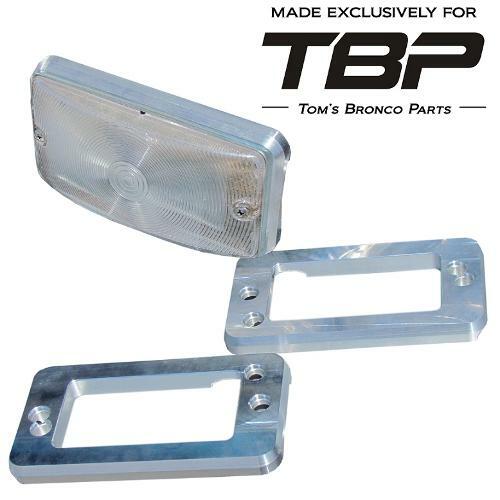 New Tom's Bronco Parts Exclusive Billet Aluminum Turn Signal Pads. One of the biggest complaints we have had on the Early Ford Broncos is the Rubber Turn Signal Pads that mount behind the Front Turn Signal Buckets on the 69-77 Broncos. They have a tendency to deteriorate into a bubbly mess and they are nearly impossible to keep clean. Finally, we have come out with a stylish, long-lasting alternative. Our Billet Aluminum Turn Signal Pads will add style to your Bronco that will last for years. You can also polish them up or anodize them for even more of a custom look. NOTE: Lens is for illustrative purposes only. NOT INCLUDED!